For May and June I am going to try to work in some blog articles on drum circles and some more on music therapy. We have been doing drum circles at our camp retreats since we started, and at first, I looked at them as thirty and as many as sixty people with drums or other sound producing instruments, sitting in a circle led by our music therapist to help break the ice and as a vehicle to introduce everyone. Later, to my amazement, I discovered that drum circles, and other types of music, have real therapeutic value and that Music Therapy is a board certified profession. Another thing that I discovered is that there are many different kinds of drum circles and they are used for many different reasons. I'll cover the ones that I have found through research on the internet and present them as accurately as possible. There is some controversy regarding the structure and intentions of some drum circles just as there seems to be in about every aspect of life, so please forgive me if I have offended you or your version of a drum circle and know that I will work with you, if you wish, to present your version as accurately as you see it. The majority of this particular article comes from Wikipedia. As a computer user I'm sure you've heard of Wikipedia. I like using Wikipedia because their definitions are free of copyright issues, mostly accurate, and I can cut and paste them into these articles easily. You'll see my added comments as bold italics like this. Here is Wiki's definition of a drum circle. "A drum circle is any group of people playing (usually) hand-drums and percussion in a circle. They are distinct from a drumming group or troupe in that the drum circle is an end in itself rather than preparation for a performance. They can range in size from a handful of players to circles with thousands of participants. 'Typically, people gather to drum in drum "circles" with others from the surrounding community. The drum circle offers equality because there is no head or tail. It includes people of all ages. The main objective is to share rhythm and get in tune with each other and themselves. To form a group consciousness. To entrain and resonate. By entraining, I mean that a new voice, a collective voice, emerges from the group as they drum together.'" I had to look up the word entrain to see what Mickey Hart was trying to say and the best I could figure out was he meant join. According to the Wikipedia definition, the term "Drum Circle" originated in the United States during the late 1960s and early 1970s for any group of people, particularly counterculture groups, who gather (informally) to play music together. The terms "drum jam" or "jam session" could be substituted. Settings include beaches, parks, concert parking lots, festivals, and retreats. Do not confuse this definition with that of the Drum Ceremony, such as those done by Native Americans, which we all know, originated way before 1960. The determining criteria for a drum circle is that the music is improvised and co-created by the participants. Drum circles may or may not be open to the public, but the music is always a group expression, not constrained by genre, instrumentation, or directed by one person or sub-group. Community - free-form drumming, often open to the public and entirely improvised in-the-moment. Facilitated or Conducted - group drumming that is musically directed by a specific person, often called a facilitator. It is this one that more closely resembles what we do at our camps. I am planning to publish an article on this blog in the near future, written by one of our Music Therapists, that will address our drum circles as well as other forms of music therapy. All forms of drum circles are used in a variety of settings and applications including; team building, recreational music making, wellness, education, celebrations, spirituality, personal growth, etc. Community drum circles are informal gatherings of people who meet for the purpose of playing drums together. They often take place in public settings such as parks or at the beach, but may also be organized via a community center or similar body. Instrumentation centers around drums and percussion, but may include other instruments, such as flutes, didgeridoos, and other non-percussion instruments. Practically anything that can be banged on to make noise can be used as a percussion instrument such as cans, buckets, pipes, etc. One need not possess or purchase a drum to participate. Community drum circles differ from facilitated or conducted drum circles in that the music is entirely improvised through a process of group interaction. There may be a facilitator or moderator who acts to shape the experience through discrete actions, such as helping to maintain a steady beat, helping those who need it, and generally managing the environment to see that everyone is able to participate fully. The participants make up the music as they go along, using their listening and playing skills to make musical connections and express themselves in any and all ways that feel right. Participation is voluntary and often includes drumming, singing or chanting, dancing, and listening. Community drum circles often attract both regular and drop-in participants of all ages and can take place just about anywhere. Community drum circles are the original and most popular form of improvised community drumming. A "facilitated" drum circle is a form of group drumming in which a person seeks to focus the intent and improve the quality and effect of the activity, making it easier for people to effectively participate by taking a more directive approach. The facilitator (leader) takes responsibility for the physical space, arranging chairs and instruments to optimise communication and connection in the group. He or she may provide a range of instruments to create a full and balanced percussion orchestra. In this way, the experience can be thought of as a "standardized drumming circle," as opposed to the more free-flowing and open community drum circle. The facilitator is constantly monitoring the music in the group, and generally being encouraging and accepting of participant ideas. In this way, the facilitator takes on a role similar to that of a music teacher or drumming instructor whose goal it is to empower the participants and encourage them to share their ideas. At the beginning the facilitator directs the music through verbal and non-verbal cuing. Cues, which often mirror the movements of an orchestral conductor, are directed at the participants, who respond to the leader. This creates a leader/follower dynamic between the facilitator and participants. Actions such as rolling (rumbling), starting, stopping, raising/lowering the volume, accents, and when to play/not play are often given by the facilitator. Conducting is not normally part of a traditional (community) drum circle, and therefore makes this type of circle a unique experience and very different from a community circle. Facilitators with training and experience in other areas and professions, such as music education, music therapy, and corporate training, may use a range of tools and approaches that enable them to work with diverse populations. These types of experiences are more accurately referred to as 'drumming programs,' rather than drum circles, in the traditional sense. Contrary to that last statement, at our camp retreats, we do refer to the group as a drum circle and we do use only board certified music therapists as facilitators. building musical skills and knowledge. practice and perform music on drums, often for dance. Is an inclusive way of life that is focused on creating a positive enhancement of self of identity while enforcing a no harm to the collective group attitude. Neotribalism belief system is evident in the music of Neotribalism; the postmodern drum circle where the only leader is the preservation of the groove or music consciousness. This development of musical consciousness takes the participation of the individual to create a collective more powerful and beautiful display of sight and sound. "In beat, life begins and it is only the maintenance and sacred keeping of the beat that life will endure". Neopagans have created another type of drum circle. At Neopagan festivals, people gather around a large bonfire, the drummers generally sitting on one side to encourage better listening. The musicians sit together and play while dancers dance and circle around the fire. Often, those present will stay and play throughout the night until dawn, treating the evening as a magical (or alchemical) working. Sound is not limited to drumming alone; there is also chanting, singing, poetry, and spoken word pieces. This type of drum circle is not usually facilitated. This type of circle tends to center around Native American Cultural Drums and rattles but is primarily focusing on the spiritual rather than the musical aspects of the culture. They are a facilitated ceremony but the leader is facilitating a shamanic journey type process rather than a musical event. Shamanic drumming is generally simple and repetitive, often considered as a form of prayer or method of trance induction, rather than as music or entertainment. During a shamanic trance or shamanic journey, the shaman uses the steady beat of the drum as a "lifeline" to find the way back to the world of ordinary consciousness. Note that in these cultures, the term "Drum Circle" would certainly not be used. Rather, the terms 'drumming ceremony" or "ceremonial drumming" would be more accurate. This description is really not of a drum circle either, in the sense that the term is commonly used. It is a drumming ceremony that takes place in a circle, but very different in content and form than a drum circle (improvised community drumming jam). This type should probably be listed under shamanic or spiritual drumming and not under drum circles. Practiced by various groups, and outlined step by step in the book, "Finding Sanctuary in Nature: Simple Ceremonies in the Native American Tradition for Healing Yourself and Others," by Jim PathFinder Ewing (Findhorn Press, Scotland, 2007), (page 147), "the medicine wheel drum circle prayer ceremony" recognizes the four directions—east, south, west, north—as spiritual Powers that can help balance and heal. The ceremony has four rounds, with drumming by all participants at the instruction of the leader allowing the energy of each direction in each round to come into the circle to facilitate prayers and healing. It has been described as "like a sweat lodge without the sweat" (page 148, Finding Sanctuary). Ewing held these ceremonies each month for seven years, as outlined in the book, in addition to shamanic drum circles, and at various sites from coast to coast in the United States since the late 1990s. Groups based on his example and the instructions outlined in the book have resulted in other groups forming worldwide. I have experienced a version of this one, first hand, at a local Native American Christian church. Their drum ceremony is very spiritual and uplifting. I was impressed. This one differs from the Shamanic one in that trance inducing is not part of the ceremony, instead, the drum is used to offer praise and prayer to God the Great Spirit and Creator. Commercial drum circle groups and companies exist in most countries to serve various markets. There is also a growing body of people working in places such as hospitals, prisons, and hospices using drumming as a form of recreational and supportive music making. Music therapists often use various forms of group drumming (including improvised drumming) in their work to reach therapeutic goals and objectives. As you will see, this article has many interesting points and touches on results that we have actually seen, first hand, with our stroke survivor campers. I need to point out, though, that in order to get the results described in this research article, a board-certified music therapist needs to be involved. We have board certified music therapists who work with us at our camps. They are producing these very results with stroke survivors. For a music experience to be called music therapy, it has to include a board certified music therapist, a client, and music experienced within a therapeutic relationship. Music is used by other types of therapists, but they don't call it music therapy. Music can also be used by caregivers in many ways to help stimulate the healing of the brain, and the best results would be achieved by working with a board certified music therapist who can prescribe music for a therapeutic outcome. You can contact the American Music Therapy Association to find a music therapist near you or go to their website at: musictherapy.org. Here is the American Music Therapy Association's definition of Music Therapy: "Music Therapy is the clinical and evidence-based use of music interventions to accomplish individualized goals within a therapeutic relationship by a credentialed professional who has completed an approved music therapy program." The following article originated on a blog hosted by an online site called X8-Drums (www.x8-drums.com) and posted by their blog moderator Kristen. Music therapy is used widely for rehabilitation of patients that have had a severe stroke. A study out of Finland reported that incorporating music into standard stroke rehabilitation treatments helps improve recovery of speech and memory. The music had a more significant impact on recovery than the use of audio books or no additional stimuli at all. The study also showed that the music lightened the spirits of patients as well. Kenny Rogers tunes produce positive response from stroke patients. After six months of therapy, the music listeners' verbal memory improved by 60% and focused attention improved by 17%, much higher than the results noted in audio book listeners or patients with nothing. Furthermore, the music listeners were happier and less confused than members of the other groups. The research was carried out on adults who had suffered an ischaemic middle cerebral artery stroke with no prior history of neurological disorder. Strokes occur when blood is unable to reach the brain, killing brain tissues. This can cause disability in movement and cognition, as well as death. Medical treatment includes medication to thin the blood that will prevent further clotting, and restrictions on the patient's diet will help to improve cholesterol levels. The stroke even causes weakness, loss of coordination, and pain. The aftermath of the event includes memory loss, confusion, depression, difficulty speaking, paralysis, and sensory loss. While listening to music, the brain boosts alertness, mood and attention due to stimulation of the dopaminergic mesocorticolimbic system, which moderates feelings of pleasure and memory, among other emotions. By stimulating this system, you trigger the wires for other parts of the brain through a neurological crossing effect. Doctors believe that the combination of music and lyrics leads to this cross over effect, which helps to recover losses in other parts of the brain. Many therapists already use music as a tool. Singing songs can boost speech recovery in stroke patients. By putting words to a familiar song melody, the patient has an easier time of forming words and phrases. Rhythm and clapping, also used by therapists, aid in the recovery of movement and muscle control. After a stroke, it's important to begin music therapy early, during the acute post-stroke stage. During this period, the brain undergoes many changes that relate to movement, memory and speech that can be augmented by stimulation. The largest benefit of musical therapy is that it fits in well with every day life. Music is everywhere, so with proper guidance you can treat yourself or your loved ones outside of the hospital, maintaining ongoing recovery and a routine of incorporating healthy brain stimulation. Music can be a worthwhile therapeutic addition to a stroke patient's care, and is cheap and easy to provide. Patients may also respond to live performance music or by playing on simple instruments themselves. Experiment with recorded music, live music and present the patient with an instrument like a small djembe or shaker. When selecting the type of music, choose something that is familiar to the patient. Playing something that they recognize will improve results of the therapy and improve memory development. Interesting enough, this study of music therapy on stroke patients showed that songs by Kenny Rogers delivered the most significant response from the patients. However, you should allow the patient to choose the music him or herself, or use music that you know the patient likes, as the familiarity of the music is frequently the key to memory retention. Selecting the type of music that stimulates the brain to craft thoughts is the technique used in music therapy to recover speech and recollection. Do you want to buy a Copier? Chuck Hofvander is a stroke survivor and fellow camper. Here is one of many essays he wrote outlining his experiences. Some of those he has written deal with his life before his first stroke, some deal with life after. Chuck likes to write essays as therapy while recovering from his strokes. He has had two, his last one very recently after a bicycle accident. This essay, although written after he had his first stroke, tells about a time before he had that stroke. What comes to your mind when someone says “I want a copy of…? “? What do they say next; Canon, HP, Toshiba? No Xerox! I worked for Xerox as a Document Expert; I had been the head of a document management area at CNA Insurance for two years, but I didn’t know anything about printing except I knew about printing was that it came out of a printer. Our focus was insurance because of my illustrious career. Our mission was to consult on projects that ended in printing. I got the job after an interview in Rochester NY with Brian S and his staff of document experts; none of whom had any insurance experience except as it was required to buy a car. There the VP had arranged a half hour meeting in the morning at the Inn and then unleashed us Xeriod’s on the un-suspecting populace of Lake Placid..
Our insurance group got together to plan our day and we agreed on our plan of attack. We’d drive to the Bob sled run and ski jumping site. Followed by a drive back to Lake Placid to go to the ice hockey arena, relax at the hotel, go to a party arranged by the VP and then finally to sleep. Little did we know there was a really amateur hockey in store for us. We drove to the Bob Sled run and there three of us backed out using excuses such as "too tall" or "too fat" or "no change of underwear in case we peed our pants,"’ I was too tall to ride in the sled, thank God; and too scared. But a few brave souls were thrilled to ride. Among them was Mister K.
Mister K was born a natural-born leader of other men. He was the type of man that if you wanted something done he asked somebody else to do it. If you asked him a question and if he didn’t know the answer, Mister K would make one up. He was that type of man. He was my hero. I looked forward to him being stuffed into a sled. We non-riders went to a club and drank coffee and the others went to the top of the course. There the riders got their turn, started their run, and put their heads and limbs down. They were scared but not Mister K.
Mister K was the last person in the sled, he stood straight up until the first turn then he realized he should be scared. His first instinct was to jump out of the sled, bad idea. Next he thought of dragging his feet behind the sled, worse idea. In the end he along with the riders sat, scared, crouching in fear until the end of the run. When the riders came to join us in the coffee shop they were all shaken except Mister K he was petrified. After Misters K’s recovery we went to the jump. Do you know how high a ski jump is at the top of the jump, well I’ll tell you it’s 295 feet; just to compare the Great Pyramid of Gaza is 481 feet. We went to the top in a glass enclosed elevator. We like a bunch of frigid robots, got out of the elevator and went outside to face a howling wind and cold. Calculate the vertical height h from the starting gate to the bottom of the ramp. The skiers push off hard with their ski poles at the start. They typically have a speed of 2.0 m/s as they reach the gate. The skiers should have a speed of no more than 30.0 m/s when they reach the bottom of the ramp. You determine that for a 80.0 kg skier with good form, friction and air resistance will do total work of magnitude 4000 J on him during his run down the slope. If you can’t understand that I’ll translate: its [freaking] high! The others weren’t brave enough to face the frigid temperature and the gale-force wind but yours truly was. They went inside but I stood firm, I took off my shirt and dared the elements to defeat me! Elements one Chuck zero! (Come on, if you believe that I’ve got a copier you might be interested in). After we thawed out we went back to Lake Placid and went to the hockey arena where in the 1980 Olympics a bunch of amateurs U.S. beat a pro level team from the Soviet Union. There nothing special happened except me crying like a baby. It brought back memories of my wife and I sitting in my parent’s living room watching the victory of the U.S. beat the Soviet Union. Fooled ya, we were at my parents place but I didn’t cry and we didn’t watch the game. There was nothing unusual at the arena except the usual souvenirs and nothing special at the hotel. Then came the party. The party was boring, we sat around like muffins in a pan waiting to be put into the oven then Mister K appeared. He was dressed in a white vest and pants and a black shirt; think John Travolta in Saturday Night Fever, and a hockey helmet. He needed the hockey because Mister K had been putting up Christmas lights on the gutters of his home and fell off the ladder. His solution was to wear a hockey helmet to prevent further damage to his cranium, if that was possible. When Mister K appeared the party came to life. He jumped onto the dance floor and, well he was not Travolta. He jumped, wiggled, drooled like a wild man on the dance floor! People were scared of him. The hotel management was about to have him put away when he collapsed and we took him back to his room. I went back to my room and went to sleep. There I dreamed that a beautiful blond woman came into my room, got undressed, climbed into my bed, crawled up next to me, began hugging me and said “Do you want to fool around.” Of course I said yes but then gorgeous blond said “Not before you do you’re chores, get to it!” It was then Brian walked into the room, saw me hugging the pillow and said “what do you think you are doing, I’ve arranged a hockey game with the VP of the financial group and it starts in 10 minutes”. Yikes what a nightmare! But it wasn’t a nightmare it was two o’clock in the morning, I’m hung over and tried. I got up, put on whatever clothes I thought would be good for a hockey game at 2:00 o’clock in the morning and joined other sleepy and drunk Xerox’ers. The hotel didn’t have an indoor rink so we went outside to Mirror Lake where it was -8 below zero. Brian is in an amateur hockey league and knows what to do with a puck but none of us others did. Brian tried to organize an offense and defense but we were hopeless. I couldn’t move backwards, others couldn’t get on skates, some couldn’t get moving once they had their skates on, some skated forward but couldn’t stop, and some just fell down! But the other team was worse; they went outside, stood there observing and went back inside. So we played with ourselves for about a half hour, we had a lot of staying power. But eventually it was Brian who gave up just when we were getting the hang of this hockey thing. In the morning I and Mister K left Lake Placid; he behaved. This experience left me with some things I’ll never forget Lake Placid is beautiful but it’s on Mirror Lake, Ski jumping is hazardous to your health; Ski jumpers have to be crazy, I’m too tall for most of anything except basketball, I’ll cry at anything, I can’t skate, I’m grateful that Mister K is my friend but you always have to be on the lookout for his drooling. Good night Chet. Good night David. Please feel free to post any comments or questions by clicking on the red word Comment following this article. If you have any questions or comments about anything that you would like to share with us please feel free to do so on any of our articles. Don't worry about being off topic. Any question or comment is welcome on any of the articles' comments section. Anyone who has had life interrupted by a stroke likely knows that it comes with a price. Sometimes a very high “price”. There are many things in life that pose challenges for us. Among the top things on that list is when personal finances take a hit. Stroke is one of those things that arrives quite without warning, interrupting life as you’ve known it and causing a complete re-frame of “normal”. Of course, care for the stroke survivor is primary at onset, but it doesn’t take long before the financial challenges start to appear. This is especially true if the stroke occurs while the patient is still working. Some employers have short and long term disability insurance and often folks have taken out their own policies, but the vast majority of people suffering a stroke while still working will take an enormous financial hit. 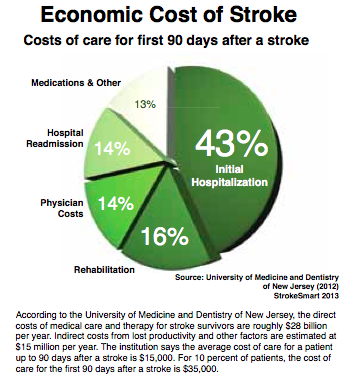 A recent article from Stroke Smart Magazine provides some good information about where the money goes with relationship to stroke. It can be mind boggling to see the actual cost incurred at a time you are already vulnerable. To see the entire article click on the pie chart. If you decide use the worksheet, make sure you "bookmark" it or make it a "favorite" in your browser so that you can easily return to it later. The site asks you to register for free so you might want to do that also so that you don't lose your work and have to re-enter everything. What About Government Financial Assistance? The Social Security Administration (SSA) has two programs that provide financial assistance for those who are unable to work. One is "Nolo’s Guide to Social Security Disability: Getting & Keeping Your Benefits" by David A. Morton III, M.D. This book may be found locally at your nearest book store or online. Call your local book store and ask if they have it in stock. For online searches, use the book title and you'll get several sites with offers ranging from $11 to $40 depending on if the media is paperback or e-Book. 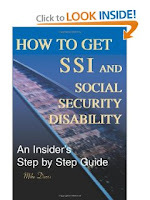 The other is "How To Get SSI and Social Security Disability: An insider’s Step by Step Guide" by Mike Davis. Again, do a search on the whole title and you'll get a list of site to order from. For this book, you can click on the image at the right and it will take you to Amazon.com where the book is listed at around $10. Here’s hoping this article will be helpful to anyone dealing with the effects of stroke in the early stages. As time goes on and life settles down, you may want to consider the job of applying for long-term disability.